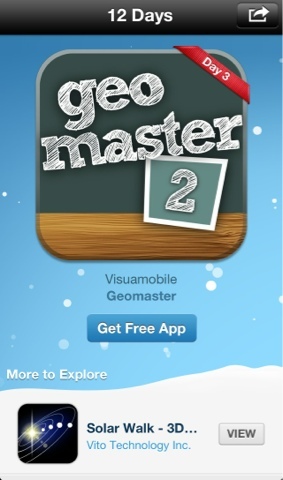 It's Day 3 of Apple's 12 Days of Christmas and today's giveaway is the app called Geomaster 2. The game tests your knowledge about World Geography. If you're cramming for your Geography exam, this is a fun app to learn from. Remember, you need to download the 12 days of Christmas app to get access.